This article contains spoilers for both The Incredibles (2004) and Incredibles 2 (2018)- You have been warned! Back in 2004, Superhero movies weren’t really that popular. Especially, superheroes independent of the big two aka DC and Marvel; and even then, it had to be either the X-Men, Spider-man, Superman or Batman. The studios wouldn’t even touch a concept like “Black Panther”. They said that “Deadpool” was too much of a NICHE character to warrant being made and that no one would go to see it. Marvel changed that opinion with their cinematic universe and they’ve shown that these obscure characters can make money. Now, instead of waiting for years for a new superhero movie. we get (at least) a couple every year. Now, the studios had good reason to think that these niche characters wouldn’t make any money. They’ve tried to do small characters before and they weren’t really that successful. Spawn, Unbreakable, V for Vendetta, The Punisher movies, and Jonah Hex to name a few. Movies that didn’t really give Hollywood a good impression. We won’t make another Incredibles movie until we have a story worthy of one. I thought to myself, I can wait and so I like the rest of the world waited for 14 long years. Now, I just want to say on the record that I think the Incredibles 2 movie is good. Unfortunately, on some level, Pixar let me down because it is not worthy of the first movie and I’m going to do my best to explain why. My main problem is starting the second movie where the first one left off. What’s the point of this? In the last movie, we saw that all the characters had satisfying arcs. Bob Parr (aka Mr. Incredible) was a great superhero and longed for the good-old-days to return. Eventually, he realized that his family is his greatest adventure and that he should take more of an interest in what’s going on at home. Helen Parr (aka Elastigirl) got over her denial and went to save her husband and remind him that he doesn’t have to be strong enough if he’s with his family- because they can help him and that she was going to be by his side no matter what. Violet Parr got over her shyness,-the movie uses visual storytelling to give the audience this information. The picture as seen here is a visual turning point for the character when she stops having her right eye being covered up with hair and becomes more confident in herself and her abilities. Dashiell Parr (Dash for short) wanted to test out his speedster abilities and wanted to experiment just how fast he could go if given the chance. He’s being held back by his mother who wants to discourage the use of the powers but he’s a kid. He really curious about the nature of his powers and what he can do and in this scene, he realizes he’s so fast that he can run on water, and is an amazing realization of what he can do. 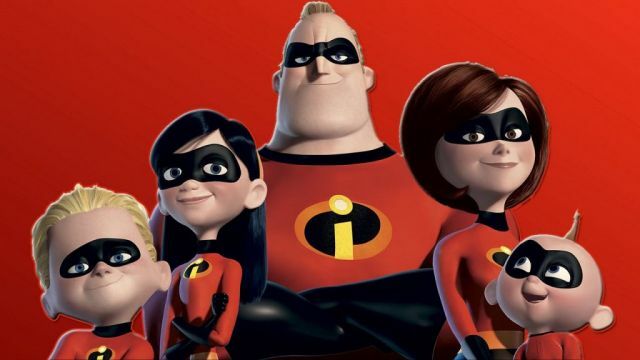 These characters arcs contributed to The Incredibles being a great story, but more importantly, they came off convincingly as regular people first! This is something Marvel has always preached, and which is one of the reasons their movies (and comics) have been so successful. So Incredibles 2 just pales in comparison to the first movie, and is just a gender-swapped retread. Another rich superhero fanboy hires the Parr family to do Superhero work:but this time they want Helen and not Bob. Violet has to ask out the same boy again and Bob has to learn to ask for help again that he doesn't need to do everything by himself. It very much feels like Incredibles 2 was written in the moment, instead of being believable they took 14 years to come up with an "IT" storyline for it. In my opinion, it's just lazy storytelling. But in the end, All this might have worked if they gave us a better villain making us believe there was a risk these heroes could die. This is my biggest problem with the movie. I don’t care really care if the heroes have to go through the same arcs (OK, maybe I do) but when one watches a superhero movie the main concern is the antagonist. What I want from a superhero movie above everything else is a strong villain. Syndrome was a good villain because he had murderous intent! The original Incredibles is littered with death around every superhero corner. In the prolog theirs a suicide jumper Oliver Sanschweet? (yes, Disney/Pixar actually gave him a name) He tells Mr. Incredible: “You didn’t save my life! You’ve ruined my DEATH!” When Helen is talking to her kids on the island for the first time she says “These guys will kill you, if you give them that chance. Don’t give them that chance." Not to mention all the supers that Syndrome murders. During the original movie, I counted a whopping 32 off-screen confirmed deaths. While this might not have fully registered while watching The original Incredibles, I do believe that it subtly adds a feeling of danger and intensity to the movie that clearly adds to one's enjoyment. Now you can say “It’s Disney, they wouldn’t kill our protagonist(s)” and my answer to that would be kids with TWO parents …? That’s not the Disney way! But in Incredibles 2, all the references to death have now been removed. The villain, Screenslaver, doesn’t really feel like a threat because even with the action and animation being top-notch, I never felt like Helen was going to die. Moreover, the rich fanboy wants to make Heroes legal again. What good or really what need for a superhero is there without a supervillain for the hero to fight? Surprise-surprise a supervillain shows up. As a villain, the Screenslaver is 'meh'! Usually, 'Hypno' villains use their abilities/powers to steal from various small crowds, they don't create big public danger scenarios. It's revealed later that the Screenslaver wants to keep heroes illegal -which doesn't make sense since they are already illegal. Just do nothing. Why make them legal again? It would make more sense if the brother and sister came up with the Screenslaver to show a need for Superheroes. You want to sell a superhero? Create a worthy foe that only a superhero can take down and the movie makes it clear that the brother is the seller. Given the flow of the story, I can see a fanboy wanting to make heroes legal again and adding them to his own personal collection which the other heroes will eventually realize leading to a big superhero vs. Fight. It’s a great scene but what does it really tell us? How does it advance the main plot? We (the audience) already know the baby has many powers. Why not show Helen fighting the small-time crooks really efficiently? Why not show why Deavor Winston felt that his father shouldn’t have gone into the panic room? All he says is "I disagree strongly!" But why does he disagree? Why wasn’t that explored? And that’s this movie in a nutshell. It’s just FILLER!!! Nobody really grows or learns anything about themselves that's new. Now there’s nothing wrong with filler. Filler, used correctly, can give the audience a much-needed break after a pulse-racing intense action scene and give much-needed levity to a story. Incredibles 2 took fourteen years to come to the big screen so it's disappointing that it was very predictable with a weak generic villain whose plan doesn't make any sense. The best part of the whole movie is Baby Jack-Jack showing off his powers instead of a story that gels like in the first movie. Brad Bird showed the world that superheroes could be more than fluff. It's true that Incredibles 2 does a lot more with animation visuals- and that is part of the fun with superheroes after all. But arguably, the story should take precedent, not the action or the animation and Incredibles 2 doesn’t even try on that part. Welp, see you in another 14 years- hopefully for a better Incredibles movie this time- one that lives up to the original.